The United Nations has reported that about one million civilians have been displaced in South Sudan since fighting erupted between government forces and rebel loyalists over 3 months ago. According to the United Nations Office for the Coordination of Humanitarian Affairs (OCHA), over 800,000 of these civilians are still within the country’s borders, while about 254,000 of them have made their way to neighbouring countries. Humanitarian agencies have warned that the crisis in the world’s youngest nation continues to prevent the distribution of much needed supplies to civilians across the country. Many of the hiding civilians are reportedly dispersed remotely, increasing the difficulty of reaching them. The UNOCHA has revealed that in total 4.9 million people are in dire need of humanitarian assistance in South Sudan, and more than 3 million of them are currently at risk of experiencing hunger strikes. With the rainy season fast approaching, the World Food Programme has announced plans of storing more than 1,500 tonnes of food as part of a rapid response plan – enough to provide meals for up to 80,000 people for one month, according to reports. The UN says it has only been able to secure 25% of the funding needed for its crisis response plan, which is already reportedly half-way to its completion (January – June). Earlier, the UN revealed that it is in need of over $1 billion to cover the cost of its operations in the war-torn country. Reports indicate that the United States Government has pledged to provide an additional $83 million to the United Nations outreach programme in South Sudan to supports the efforts to reach many internally displaced persons, who are reportedly in dire need of food and medical supplies. Isolated outbreaks of violence have been reported in several states in South Sudan since the warring factions penned a ceasefire agreement in January. However, both sides continue to trade blame for sparking the skirmishes. Meanwhile, representatives of the warring factions resumed discussions in Addis Ababa last week in hopes of reaching a truce to the spiralling violence in the devastated nation. 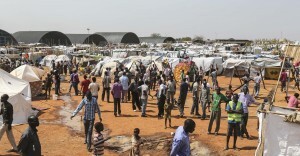 Photo by UN/Isaac Billy: A United Nations Refugee Camp in Juba.